This was Thomson’s first novel–she’s since published at least one other, Virtual Girl–but it is one of those rare ones that are full of power. I was skeptical–this was my top choice on my Alexandria Digital Literature recommendation list, but only when I sorted using “Daring” as an option. When I finally got the book through ILL, I despaired. It was nearly 400 pages. That’s a lot of words to invest in an untried author. But AlexLit’s recommendations have been pretty solid, so I took the book with me to Texas for the holiday season. 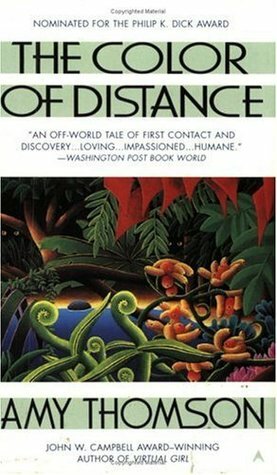 It is a first contact science fiction story, but one in which the human gets stranded on a planet, changed through the biotechnology of the aliens into something neither human nor alien, and then has to act as a mediator between humans and the aliens who saved her life. Although I can’t think of another story with this plot, it does not feel all that unique. Thomson’s treatment of it is, though. Her alien world is based on concepts taken from our own rainforests and her aliens use organic means where humans use mechanical means. The latter is not as clear cut as it may seem, for Thomsom’s milieu is far enough into the future that her mechanical computer “flows” rather than clicks, indicating a level of nanotechnology. Once I got into the book–about 50 to 60 pages in–the characters took hold and propelled me through it. 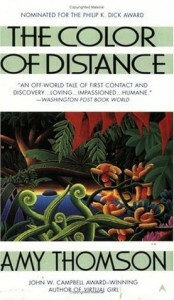 Thomson’s point-of-view switches are clearly indicated, most taking place at chapter breaks, and her aliens come across as truly alien, rather than humans in fur. And I really haven’t mentioned one of the central conceits of the book, and that is the aliens’ form of communication–through color and vision totally, with no sound. There’s a lot here, and the ending, while sentimental, is not maudlin.